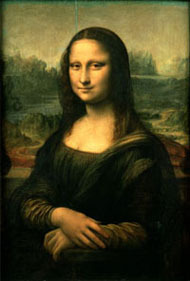 Did Mona Lisa Have Bad Teeth? Is having straight white teeth as American as apple pie? I recently came across this article that thinks so. Written by a British author who spends time in Florence she suggests that Americans stand out while in other countries because of their smiles. If you look back through out history you never see people showing their teeth in artwork. The author kind of comes across as anti-pretty teeth. My thought… What’s wrong with pretty teeth? People’s view of beauty is constantly changing. During the Great Depression being “chubby” was envied because it showed you had money to buy food, now being thin is in. In the 1800’s being pale meant you didn’t have to go and work in the fields and was the desired look. Then being able to go on vacation to exotic places and lay out and tan was the “cool” thing to do. Straightening and whitening your teeth are one of the easier and cheaper cosmetic things you can do to improve your overall looks. It only takes a quick appointment with Dr. Nichole Martin in Lynnwood to make you custom bleaching trays so you can start the teeth whitening process and dazzle people with your smile this holiday season!